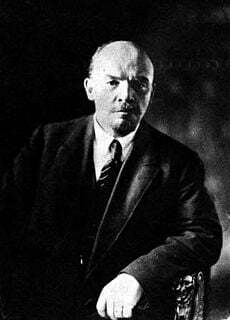 Vladimir Ilyich Ulyanov, better known by the name Lenin (April 22, 1870 – January 24, 1924), was a Marxist leader who served as the key architect of the October Revolution, and the first leader of the Soviet Russia. Lenin's legacy, around which a personality cult developed in the USSR, was an oppressive system that dictated how people lived their lives, where they lived, and what they thought. It suppressed dissent, free-thought, and any opposition with terror. Yet Lenin’s original conversion to Marxism stemmed from a profound sense of disappointment and disdain for Tsarist rule. What was meant to evolve into a society free from class distinction became a society that was dominated by the political apparatus created by a revolutionary vanguard that clung to its power with more violence than the previous political elite had. Lenin's intellectual legacy as a Marxist theoretician included the conviction that Communism's expansion into the rest of the world would be achieved through struggles of national liberation beginning not with the working class of the elite nations of Europe but through a reformed view of the oppressed class that could include intellectuals, workers and peasants. In the case of Russia, it also included soldiers who had wearied from the staggering losses provoked by Russia’s involvement in the first World War. Lenin also put forth the need for a "revolutionary vanguard," asserting that the working class could never achieve proletarian consciousness by itself. Lenin also developed the theory of Imperialism that proposed spreading Communism in the developing world to encircle the West. He taught that it was possible to establish a communist state in an agrarian economy without going through the stage of capitalism under the bourgeois rule. The extent to which Lenin was both the philosophical and the structural architect of the Soviet system is evidenced by the fact that the ideology of the state is often termed Marxism-Leninism. Born in Simbirsk, Russian Empire (now Ulyanovsk), Lenin was the son of Ilya Nikolaevich Ulyanov (1831–1886), a Russian civil service official who worked for progressive democracy and free universal education in Russia, and his wife Maria Alexandrovna Ulyanova (1835–1916). The two raised their children in the spirit of denial of autocracy and religion. All of their children, except early deceased Olga, became professional revolutionaries. Although the family was of mixed ethnic ancestry, "Lenin's antecedents were Russian, Kalmyk, Jewish, German and Swedish, and possibly others," Lenin was baptized into the Russian Orthodox Church. Two tragedies occurred early in Lenin’s life. The first occurred when his father died of a cerebral hemorrhage in 1886. In May 1887 his eldest brother Alexander Ulyanov was hanged for participation in a terrorist bomb attack that threatened the life of Tsar Alexander III; his sister Anna, who was with Alexander at the time of his arrest, was banished to the small town of Kokuchkino near Karzan. 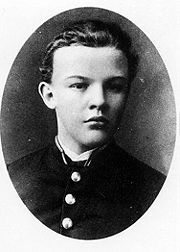 Lenin’s brother was given several opportunities by Tsarist authorities to recant his position with the promise that he would receive a more lenient sentence were he to do so. However he refused to do so and Alexander’s execution is considered as a key cause in Lenin’s radicalization. His official Soviet biographies list this event as central to his revolutionary exploits. A famous painting by Belousov, We Will Follow a Different Path, which was reprinted in millions of Soviet textbooks, depicted young Lenin and his mother grieving the loss of his elder brother. The phrase "We will follow a different path" meant that Lenin chose a Marxist approach for a popular revolution, instead of the anarchistic methods of his brother who had ties with the Narodnaya, a popular Russian anarchist movement committed to the overthrow of the Tsar. 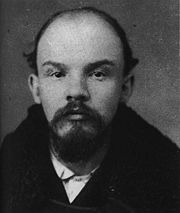 As Lenin became interested in Marxism, he got involved in student protests and was subsequently arrested. He was then expelled from Kazan State University. He continued to study independently through Saint Petersburg University and in 1891 he had completed his studies in law. He distinguished himself in Latin and Greek, and also learned German, French, and English. Lenin is credited with translating the Communist Manifesto from German into Russian. Lenin worked for some years in Samara, Russia, then in 1893 moved to Saint Petersburg. Rather than settling into a legal career, he became more involved in revolutionary propaganda efforts and the study of Marxism. On December 7, 1895, he was arrested and held by authorities for 14 months, then exiled to the village of Shushenskoye in Siberia. In July 1898 Lenin married Nadezhda Krupskaya, who was a socialist activist. In April 1899 he published the book The Development of Capitalism in Russia. In 1900 his exile ended and he traveled throughout Russia and elsewhere in Europe. He lived in Zurich, Geneva (where he lectured and studied at Geneva State University), Munich, Prague, Vienna, Manchester, and London. During his exile Lenin co-founded the newspaper Iskra (Russian for the spark—the spark that ignites the flame of communism) with Julius Martov, who later became a leading opponent. Lenin also wrote several articles and books related to the revolutionary movement. At this period, he started using various aliases, finally settling upon Lenin. He was active in the Russian Social Democratic Labor Party (RSDLP), and in 1903 he led the Bolshevik (from Russian bolshiy for bigger—the bigger part of the RSDLP who supported his concept of strict discipline and centralization) faction after a split with the Mensheviks (correspondingly, from Russian menshiy for smaller—the smaller part of the RSDLP favored a democratic approach) that was partly inspired by his pamphlet What is to be Done? This is said to be one of the most influential pamphlets in pre-revolutionary Russia, with Lenin himself claiming that three out of five workers had read it or had had it read to them. In 1906 he was elected to the Presidium of the RSDLP. In 1907 he moved to Finland for security reasons. He continued to travel in Europe and participated in many socialist meetings and activities, including the Prague Party Conference of 1912 and the Zimmerwald Conference of 1915. Lenin later moved to Switzerland. Lenin made key contributions to Communist thought. In What is To Be Done? (1901), he posited the need for an elite revolutionary vanguard that would guide the worker in the revolutionary process. There he also argued it would be possible to move immediately from feudalism to socialism and circumvent the capitalist stage of social and political development. This was a fundamental contradiction with Marx’s understanding of the proletarian class. Bernard-Henri Levy points out that in his critique of Hegel’s Philosophy of Law. Introduction, Marx clarified that the working class was not synonymous with the proletariat. Proletarian consciousness and the proletarian identity were forged through capitalist oppression and a concomitant awakening in the working class that would lead to the working class becoming the proletariat. However Lenin argued that the elite revolutionary vanguard of which he was a part would be able to inculcate proletarian values and identity into the working class through their leadership and through means such as the creation of a newspaper that would reach out to the working class. In Imperialism the Highest Stage of Capitalism (1916) as well as in Lenin’s Notes on Imperialism (1916) Lenin defended Marx’s economic theories, particularly Marx’s theory of surplus value. Marx's theory of surplus value maintained that all profit originated from providing workers survival or necessary wages rather than real wages while machines could not produce profit; hence as the role of machinery became more central to the modern industrial state three economic laws would come into play: First, the centralization of capital, as fewer industries could afford the ever improving machinery that increased productivity and reduced the cost of goods many of them would become bankrupt; second, Marx foresaw that the increase in machinery and the reduced need for workers would, based on his axiom, lead to a decrease in profits; third, the closing of factories and the laying off of workers would lead to an increase in poverty. Marx argued that the combination of these volatile elements would lead to discontent, outrage and revolution. However, successors to Marx and Engels such as Eduard Bernstein in his book Evolutionary Socialism (1895) concluded that although Marx’s intentions were noble, his economic theories and forecast were wrong. Bernstein also came to conclude that Marx’s analysis of history as a history of revolution and his interpretation of the dialectic were all misguided. Bernstein argued that instead of working for revolution socialists should strive for change through the democratic process and the ballot box. 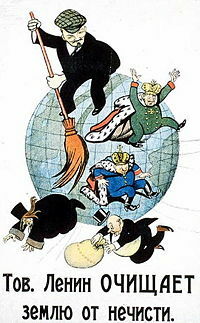 Lenin’s Imperialism the Highest Stage of Capitalism (1916) countered Bernstein. Lenin asserted that Marx is not wrong but rather capitalists had found a new way to survive and prosper: through exporting and providing finances for their products in their political and economic colonies in less developed countries. By charging exorbitant prices and high interest rates the capitalist had found inroads into the rich natural resources of Africa, Latin America, and Asia. With this new wealth it became possible to bribe the workers of the developed world with higher wages and thus the workers would have no appetite for revolution. Lenin argues that there is only one way to stop imperialism, the new brand of capitalism—that is through cutting off their markets in their colonies. In State and Revolution (1917) Lenin challenged his Marxist cohorts who argued that following the communist revolution a socialist state should be democratically lead. Lenin maintained and demonstrated through the writings of Marx and Engels that instead it would have to be lead by a "dictatorship of the proletariat". Otherwise it risked reverting back to capitalism. Lenin was the author of several theoretical works in philosophy, such as Materialism and Empiriocriticism which became fundamental in Marxism-LeninismMarxist-Leninist]] philosophy. When the First World War began in 1914, the large Social Democratic parties of Europe (at that time self-described as Marxist), including luminaries such as Karl Kautsky, supported their various countries' war efforts. Lenin strongly opposed this. This led him to a final split with the Second International, which was composed of socialists who favored a “big tent” approach to socialism. Lenin adopted the position that what he described as an “imperialist war” should be turned into a civil war between the classes. With the advance of the war, the industrial and cultural backwardness of Russia became evident, the financial system came to complete decline, the army suffered defeat after defeat, and the whole country came to the brink of social disaster. This led to the February Revolution of 1917. After the 1917 February Revolution and the overthrow of Tsar Nicholas II, Lenin knew he needed to travel back to Russia as soon as possible, but he was isolated in neutral Switzerland as the First World War was raging. The Swiss communist Fritz Platten (1883-1942), however, managed to negotiate with the German government for Lenin and his company to travel through Germany by train. The German government hoped Lenin would cause political unrest back in Russia, which would help to end the war on the Eastern front. Once through Germany, Lenin continued by ferry to Sweden, and the rest of the trip through Scandinavia was arranged by the Swedish Communists Otto Grimlund and Ture Nerman. On April 16, 1917, Lenin arrived in Petrograd and took a leading role within the Bolshevik movement, publishing the April Theses, which called for an uncompromising opposition to the provisional government. Initially, Lenin isolated his party through this lurch to the left. However, this uncompromising stand meant that the Bolsheviks were to become the obvious home for all those who became disillusioned with the provisional government, and with the "luxury of opposition," the Bolsheviks did not have to assume responsibility for any policies implemented by the government. An intolerable atmosphere has been created, in which you as well as we are choking. They are throwing dirty accusations at Lenin and Zinoviev. Lenin has fought thirty years for the revolution. I have fought twenty years against the oppression of the people. And we cannot but cherish a hatred for German militarism. … I have been sentenced by a German court to eight months’ imprisonment for my struggle against German militarism. This everybody knows. Let nobody in this hall say that we are hirelings of Germany. After a failed Bolshevik uprising in July, Lenin fled to Finland for safety. He returned in October, inspiring the arrest of the Provisional Government under the slogan "All Power to the Soviets!" The October Revolution was more of a putsch than a revolution. However the impact of this bold step changed the world’s political landscape. Lenin’s ideas on government were expressed in his essay State and Revolution which called for a new form of government based on workers' councils, or "soviets" elected and revocable at all moments by the workers who were in turn to subordinate to their representatives. On October 26, 1917, the Soviet government issued a decree of peace (withdrawal from the war), a decree of land (all the land became a property of the state and was to be passed over to peasantry free of charge), and a declaration of peoples rights (Russia became a classless society and every nation had a right of secession from Russia). Michael Voslensky in his book The Nomenklatura states that Lenin joked that while nations had the right to secession they would not have the opportunity for secession. On November 8, Lenin was elected as the Premier of the Council of People's Commissars by the Russian Soviet Congress. Lenin lobbied for socializing the health care system, the emancipation of women, and teaching the illiterate Russian people to read and write. But first and foremost, the new Bolshevik government needed to take Russia out of the World War. Faced with the threat of a continuing German advance eastwards, Lenin argued that Russia should immediately sign a peace treaty. Other Bolshevik leaders advocated continuing the war as a means of stimulating revolution in Germany. Trotsky, who led the negotiations, advocated an intermediate position of "No War, No Peace," calling for a peace treaty only on the conditions that no territorial gains on either side be consolidated. After the negotiations collapsed, the Germans renewed their advance, resulting in the loss of much of Russia's western territory. As a result of this turn of events, Lenin's position consequently gained the support of the majority in the Bolshevik leadership. On March 3, 1918, Lenin removed Russia from World War I by agreeing to the Treaty of Brest-Litovsk, under which Russia lost significant territories in Europe. After the Bolsheviks lost the elections for the Russian Constituent Assembly, they used the Red Guards to shut down the first session of the Assembly on January 19. 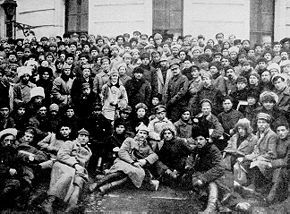 Later, the Bolsheviks organized a counter-Assembly, the third Congress of Soviets, arranged so that they and their allies held over ninety percent of the seats. This marked the beginning of the steady elimination of all factions and parties whose views did not correspond to the position taken by Lenin and the Bolsheviks from political life. The Bolsheviks formed a coalition government with the left wing of the Socialist Revolutionaries. However, their coalition collapsed after the Social Revolutionaries opposed the Brest-Litovsk treaty, and joined other parties in seeking to overthrow the Bolshevik government. Lenin responded to these efforts by a policy of wholesale persecution, which included jailing some of the members of the opposing parties. 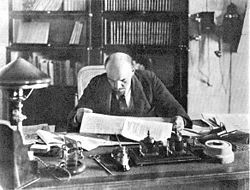 From early 1918, Lenin campaigned for a single, democratically accountable individual to be put in charge of each enterprise, which was contrary to most conceptions of workers' self-management, but absolutely essential for efficiency and expertise. Little now remained of the more democratic Factory Committee system. Many felt that the system was unnecessary because the workers now owned the means of production. To protect the newly-established Bolshevik government from counter-revolutionaries and other political opponents, the Bolsheviks created a secret police, the Cheka (from the Russian for extraordinary committee). The Bolsheviks had planned to hold a trial for the former tsar, but in August 1918 the White Army (the force defending Imperial Russia) was advancing on Yekaterinburg (where the once royal family was being held). Jacob Sverdlov (1885–1919), the party official in charge, submitted to the request of the local Soviets to execute the tsar immediately, rather than having him taken by the Whites. As a result, the tsar and his immediate family were executed. 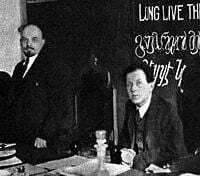 Lenin and Fritz Platten in 1919. On January 14, 1918, an assassination attempt was made against Lenin’s car by unknown gunmen in Petrograd. Lenin and Fritz Platten were in the back of the car together, after having given a public speech. When the shooting started, "Platten grabbed Lenin by the head and pushed him down. Platten’s hand was covered in blood, having been grazed by a bullet as he was shielding Lenin." On August 30, 1918, Fanya Kaplan, a member of the Socialist Revolutionary Party, approached Lenin after he had spoken at a meeting and was on the way to his car. She called out to Lenin, who turned to answer. She immediately fired three shots, two of which struck him in the shoulder and lung. Lenin was taken to his apartment in the Kremlin, refusing to venture to a hospital since he believed that other assassins would be waiting there. Doctors were summoned and they decided that it was too dangerous to remove the bullets. Lenin eventually recovered, though his health declined from this point. It is believed that this incident contributed to his later strokes. The Communist government responded to the assassination attempt, and to the increasingly mobilizing anti-communist offensive of which it was a component, with what they termed the Red Terror. Tens of thousands of real and perceived enemies of the Revolution, many accused of actively conspiring against the Bolshevik government, were executed or put in labor camps. The Red Terror coincided with the escalation of the Civil War and the implementation of a policy known as “War Communism.” Among other things, this involved forced grain requisitions from the peasantry, and became a cause of widespread famine. According to British historian Orlando Figes, Lenin had always been an advocate of "mass terror against enemies of the revolution" and was open about his view that the proletarian state was a system of organized violence against the capitalist establishment. Figes also claims that the terror, while encouraged by the Bolsheviks, had its roots in the common anger against the privileged. 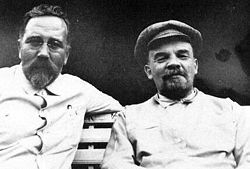 When in late 1918 Kamenev and Bukharin tried to curb the "excesses" of the Cheka, it was Lenin who defended it. Lenin remained an enthusiastic advocate of mass terror. In 1922, on his instigation, some eight thousand priests and laymen were executed, following an uprising by the clergy in the textile town of Shuia. Ironically, before the October Revolution of 1917, the tsarist secret police viewed the Socialist Revolutionary Party as the most radical group supporting terrorist tactics because of their role in organizing social unrest from 1905–1907. The Bolsheviks were viewed merely as a bunch of theorizing intellectuals. 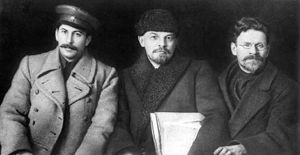 In March 1919 Lenin and other Bolshevik leaders met with revolutionary socialists from around the world and formed the Communist International. Members of the Communist International, including Lenin and the Bolsheviks themselves, broke off from the broader socialist movement. From that point on, they would become known as "communists". In Russia, the Bolshevik Party was renamed the Russian Communist Party (Bolsheviks), which eventually became the CPSU. Meanwhile, the civil war raged across Russia. Supporters of a wide variety of political movements took up arms to support or overthrow the Soviet government. Although many different factions were involved in the civil war, the two main forces were the Red Army (communists) and the pro-Imperialist White Army. Foreign powers such as France, Britain, the United States, and Japan also intervened in this war (on behalf of the White Army), though their impact was peripheral at best. Eventually, the more organizationally proficient Red Army, led by Leon Trotsky, won the civil war, defeating the White Army and their allies in 1920. Smaller fights, however, continued for several more years. Both White and Red Army forces, during this tumultuous time of war and revolution, "behaved with great brutality and cruelty in areas they controlled. Towns were burned, property destroyed or stolen, peasant farmers' crops and livestock taken by force—if people objected, they faced torture and execution." Far from being dictated by military necessity, Brovkin has argued that this level of terror was highly counterproductive. Alienation of the population behind the lines can explain, according to him, both red and white defeats during the civil war. In late 1919 successes against the White Russian forces convinced Lenin that it was time to spread the revolution to the West, by force if necessary. When the newly independent [Poland|Second Polish Republic]] began securing its eastern territories, which had been seized by Russia in the dividing of Poland in the late eighteenth century, it clashed with Bolshevik forces for dominance in these areas. This led to the outbreak of the Polish-Soviet War in 1919. With the revolution in Germany and the Spartacist League on the rise, Lenin viewed this as the perfect time to "probe Europe with the bayonets of the Red Army." Lenin saw Poland as the bridge that the Red Army would have to cross in order to link the Russian Revolution with the communist supporters in the German Revolution, and to assist other communist movements in Western Europe. However the defeat of Soviet Russia in the Polish-Soviet War invalidated these plans. When the Russian Civil War was won, Lenin used military force to assimilate the newly independent nations Armenia, Georgia, and Azerbaijan, arguing that the inclusion of those countries into the newly emerging Soviet government would shelter them from capitalist imperial ambitions. The long years of war, the Bolshevik policy of War Communism, the Russian Famine of 1921, and the encirclement of hostile governments took their toll on Russia and much of the country lay in ruins. There were many peasant uprisings, the largest being the Tambov Rebellion. After an uprising by the sailors at Kronstadt in March 1921, Lenin replaced the policy of War Communism with the New Economic Policy (NEP), in a successful attempt to rebuild industry and, especially, agriculture. The new policy was based on the recognition of political and economic realities such as private business, though it was intended merely as a tactical retreat from the socialist ideal. The whole policy was later reversed by Stalin. The Tsarist police, in alliance with the landowners and the capitalists, organized pogroms against the Jews. The landowners and capitalists tried to divert the hatred of the workers and peasants who were tortured by want against the Jews. Only the most ignorant and downtrodden people can believe the lies and slander that are spread about the Jews. It is not the Jews who are the enemies of the working people. The enemies of the workers are the capitalists of all countries. Among the Jews there are working people, and they form the majority. They are our brothers, who, like us, are oppressed by capital; they are our comrades in the struggle for socialism. Shame on accursed Tsarism which tortured and persecuted the Jews. Shame on those who foment hatred towards the Jews, who foment hatred towards other nations. While Lenin remained opposed to outward forms of anti-Semitism (and all forms of racism) and allowed Jewish people to rise to the highest offices in both party and state, the record of his government in this regard was highly uneven. Lenin was aware of pogroms carried out by units of the Red Army during the war with Poland, though the whole issue was effectively ignored. It has been said by the Russian historian Dimitri Volkogonov that "While condemning anti-Semitism in general, Lenin was unable to analyse, let alone eradicate, its prevalence in Soviet society." However, according to Zvi Gitelman, University of Michigan Preston Tisch professor of Judaic studies, "Never before in Russian history—and never subsequently has a government made such an effort to uproot and stamp out antisemitism." Lenin's health had already been severely damaged by the strains of revolution and war. The assassination attempt earlier in his life also added to his health problems. The bullet was still lodged in his neck, too close to his spine for medical techniques of the time to remove. In May 1922 Lenin had his first stroke. He was left partially paralyzed on his right side, and his role in government declined. After the second stroke in December of the same year, he resigned from active politics. In March 1923 he suffered his third stroke and was left bedridden for the remainder of his life, no longer able to speak. After his first stroke, Lenin dictated several papers regarding the government to his wife. Most famous of these is Lenin's testament, which, among other things, criticized top-ranking communists, especially Josef Stalin. Lenin said that Stalin, who had been the Communist Party's general secretary since April 1922, had "unlimited authority concentrated in his hands" and suggested that "comrades think about a way of removing Stalin from that post." Upon Lenin's death, his wife Nadezhda Krupskaya mailed his testament to the central committee, to be read at the Thirteenth Party Congress in May 1924. However, because the will criticized all of the most prominent figures in the central committee: Grigory Zinoviev, Lev Kamenev, Nikolai Bukharin, and Josef Stalin, the committee had a vested interest in not releasing the will to the wider public. The central committee justified this by stating that Lenin had been mentally ill in his final years and, as such, his final judgments were not to be trusted. Lenin's Testament was first officially published in 1926 in the United States by Max Eastman. Lenin died on January 21, 1924, at the age of 53. The official cause given for Lenin's death was cerebral arteriosclerosis, or a fourth stroke. But out of the 27 physicians who treated him, only eight signed onto that conclusion in his autopsy report. Therefore, several other theories regarding his death have been put forward. Most historians still agree that the most likely cause of his death was a stroke induced by the bullet still lodged in his neck from the assassination attempt. The city of Petrograd was renamed Leningrad in Lenin’s honor three days after his death. This remained the name of the city until the collapse and liquidation of the Soviet Union in 1991, when it reverted to its original name, Saint Petersburg. During the early 1920s the Russian movement of cosmism (a quasi-religious movement) was quite popular. Because of this, there was intent to cryonically preserve Lenin's body in order to revive him in the future. Necessary equipment was purchased abroad, but for a variety of reasons the plan was not realized. 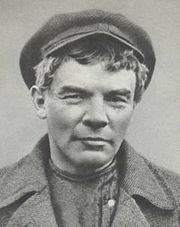 Instead his body was embalmed and placed on permanent exhibition in the Lenin Mausoleum in Moscow on January 27, 1924. However, the subject of interring Lenin's body has been a recurring topic for the past several years in Russia. 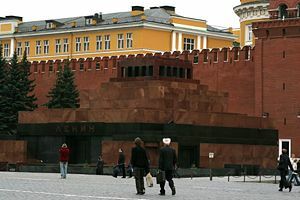 Lenin's preserved body is on permanent display at the Lenin Mausoleum in Moscow. Because of Lenin's unique role in the creation of the first Communist state, and despite his expressed wish shortly before his death that no memorials be created for him, his character was elevated over time. 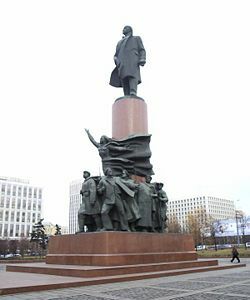 By the 1980s every major city in the Soviet Union had a statue of Lenin in its central square, either a Lenin street or a Lenin Square, and often 20 or more smaller statues and busts throughout its territory. Collective farms, medals, hybrids of wheat, and even an asteroid were named after him. Children were taught stories about "granddaddy Lenin" while they were still in kindergarten. It is argued that a system that denies God and the existence of the spiritual realm may have needed to compensate for this by raising a man to the status of a god. A statue of Lenin in Kiev, Ukraine. 2006. Since the fall of the Soviet Union, the level of reverence for Lenin in post-Soviet republics has declined, but he is still considered an important figure by the generations who grew up during the Soviet period. Most statues of Lenin have been torn down in Eastern Europe, but many still remain in Russia. The city of Leningrad returned to its original name, Saint Petersburg, but the surrounding Leningrad Oblast still carries his name. The citizens of Ulyanovsk, Lenin's birthplace, have so far resisted all attempts to revert its name to Simbirsk. Lenin's brain was removed before his body was embalmed. The Soviet government commissioned the well-known German neuroscientist Oskar Vogt to study Lenin's brain and to locate the precise location of the brain cells that are responsible for "genius." The study was performed in Vladimir Bekhterev's Institute of the Brain. Vogt published a paper on the brain in 1929 in which he reported that while the brain was discolored, shrunken, and showed "widespread areas of softening," some pyramidal neurons in the third layer of Lenin's cerebral cortex were very large. However, the conclusion of this discovery’s relevance to genius was contested. Vogt's work was considered unsatisfactory by the Soviets. Further research was continued by the Soviet team, but the work on Lenin's brain was no longer advertised. Contemporary anatomists are no longer convinced that morphology alone can determine the functioning of the brain. Lenin's writings were carefully censored under the Soviet regime after his death. In the early 1930s it became accepted dogma under Stalin to assume that neither Lenin nor the Central Committee could ever be wrong. Therefore, it was necessary to remove evidence of situations where they had actually disagreed, since in those situations it was impossible for both to have been right at the same time. Trotsky was a particularly vocal critic of these practices, which he saw as a form of deification of a human being who could, and did, make mistakes. Later, even the fifth “complete” Soviet edition of Lenin's works (published in 55 thick volumes between 1958 and 1965) left out parts that either contradicted dogma or showed their author in too poor a light. In his 1967 book Red October: The Bolshevik Revolution of 1917, Robert V. Daniels presents Lenin as the mastermind of the Bolshevik Revolution; however, he paints Stalin as the one who spoiled Lenin's revolution. The revelations resulting from the opening of the historical archives of the Soviet Union make it clear that the seeds and the rationale for genocide did not begin with Stalin but with Lenin. Lenin, Vladimir IIlyich. The Development of Capitalism in Russia Retrieved May 31, 2007. Lenin, Vladimir Ilyich. What is to be Done? Retrieved May 31, 2007. Lenin, Vladimir Ilyich. One Step Forward, Two Steps Back Retrieved May 31, 2007. Lenin, Vladimir Ilyich. Two Tactics of Social-Democracy in the Democratic Revolution Retrieved May 31, 2007. Lenin, Vladimir Ilyich. Materialism and Empirio-Criticism Retrieved May 31, 2007. Lenin, Vladimir Ilyich. The Revolutionary Proletariat and the Right of Nations to Self-Determination Retrieved May 31, 2007. Lenin, Vladimir Ilyich. Imperialism, the Highest Stage of Capitalism Retrieved May 31, 2007. Lenin, Vladimir Ilyich. The State and Revolution Retrieved May 31, 2007. Lenin, Vladimir Ilyich. The Proletarian Revolution and the Renegade Kautsky Retrieved May 31, 2007. Lenin, Vladimir Ilyich. Left-Wing Communism: An Infantile Disorder Retrieved May 31, 2007. Lenin, Vladimir Ilyich. Last Testament Retrieved May 31, 2007. Lenin, Vladimir Ilyich. To: Comrade Stalin Retrieved May 31, 2007. ↑ Belousov. We Will Follow a Different Path by Belousov painting of Lenin at age 17, Retrieved May 30, 2007. ↑ Vladimir Ilyich Lenin, Development of Capitalism in Russiamarxists.org. Retrieved September 23, 2008. ↑ Vladimir Ilyich Lenin, What is to be done?, translated by Joe Fineberg and George Hanna.marxists.org. Retrieved May 30, 2007. ↑ Vladimir Ilyich Lenin, April Theses marxists.org. Retrieved May 30, 2007. ↑ Leon Trotsky, The History of the Russian Revolution marxists.org. Retrieved May 30, 2007. ↑ Vladimir Ilyich Lenin, The State and Revolutionmarxists.org. Retrieved May 30, 2007. ↑ "Women and Marxism." Women and Marxism Archivemarxists.org. Retrieved May 30, 2007. ↑ Museum of Communism. The Russian Coup d'Etat: November, 1917 George Mason University. Retrieved May 30, 2007. ↑ Matthew White, "Source List and Detailed Death Tolls for the Twentieth Century Hemoclysm" Russian Civil War (1917-22) Retrieved May 30, 2007. ↑ BBC White Army Weaknesses Retrieved May 30, 2007. ↑ Vladimir Ilyich Lenin, The Revolutionary Proletariat and the Right of Nations to Self-Determinationmarxists.org. Retrieved May 30, 2007. ↑ Vladimir Ilyich Lenin, Anti-Jewish Pogroms marxists.org. Retrieved May 30, 2007. ↑ Zvi Gutelman. “Soviet Antisemitism and its Perception by Soviet Jews.” in M. Curtis, (ed). Antisemitism in the Contemporary World. (Boulder, CO: Westview. 1986. ISBN 0813301572), 189–190. ↑ Leon Trotsky, On Max Eastmanmarxists.org. Retrieved May 31, 2007. ↑ Richard Pipes, Flight From Freedom: What Russians Think and Wantforeignaffairs.org. Retrieved May 31, 2007. ↑ John Vernon, book review, Lenin's Brain, By Tilman Spengler. Translated by Shaun Whiteside. (New York: Farrar, Straus & Giroux) Journey to the Center of the HeadThe New York Times, Books, August 29, 1993, Retrieved May 31, 2007. ↑ Leon Trotsky, The History of the Russian Revolutionmarxists.org. Retrieved May 31, 2007. ↑ Orlando Figes, book review of Richard Pipes, (ed. ), with David Brandenberger. The Unknown Lenin From the Secret Archive. Russian documents translated by Catherine A. Fitzpatrick. (New Haven: Yale University Press. , 1999.) Censored by His Own RegimeThe New York Times, Books, October 27, 1996. Retrieved May 31, 2007. Figes, Orlando, book review of Richard Pipes, (ed. ), with David Brandenberger. The Unknown Lenin From the Secret Archive. Russian documents translated by Catherine A. Fitzpatrick. (New Haven: Yale University Press. , 1999.) "Censored by His Own Regime." The New York Times, Books, October 27, 1996. Fischer, Louis. The Life of Lenin. New York, Harper & Row. 1964. Gutelman, Zvi. “Soviet Antisemitism and its Perception by Soviet Jews.” in M. Curtis, ed. Antisemitism in the Contemporary World. Boulder, CO: Westview. 1986. ISBN 0813301572, 189–190. King, Greg and Penny Wilson. The Fate of the Romanovs Retrieved May 30, 2007. Lenin Internet Archive. Lenin Internet Archive: Biography Retrieved May 31, 2007. Payne, Robert. The Life And Death Of Lenin. New York, Simon and Schuster. 1964. Shub, David. Lenin, a biography. Garden City, NY: Doubleday. 1948. Toynbee, Arnold. "A Centenary View of Lenin." International Affairs 46 (3) (1970): 490–500. Trotsky, Leon. Lenin; Notes for a Biographer. New York: G. P. Putnam’s Sons. 1971. All links retrieved July 30, 2014. Bryan Caplan, curator, Museum of Communism. Lenin and the First Communist Revolutions George Mason University. This page was last modified on 22 March 2018, at 21:35.